A steel welding table is a basic necessity for any welder's workspace, since welding on a wooden surface can present a very real fire hazard. In addition, with a steel table, the welder's work clamp can be attached to it, and parts placed on the table will be electrically connected with the table's surface. This provides the advantage of keeping the work clamp and its cable out of your way while welding. Finally, building your own welding table with allow you to stand upright and place smaller projects at the right height for welding. Following are instructions for building your own metal welding table. All of the items, with the exception of the metal plates needed for the shelves, can be found readily available at your local home improvement store. The steel plates can be purchased from a local steel supplier easily found in your local yellow pages. Expect to complete this project in less than four hours. The estimated cost for the materials to build this welding table is $50. It is important to use enough ventilation to keep the fumes and gases from your breathing zone. For occasional welding in a large room with good cross-ventilation, natural ventilation may be adequate if you keep your head out of the welding fumes. However, be aware that strong drafts directed at the welding arc may blow away the shielding gas and affect the quality of your weld. In planning your workshop ventilation, it is preferable to use ventilation that pulls fume from the work area rather than blows necessary shielding gas away. Remember, elecrtric shock can kill. Wear dry, hole-free leather gloves when you weld. Never touch the electrode or work with bare hands when the welder is on. Be sure you are properly insulated from live electrical parts, such as the electrode and the welding table when the work clamp is attached. Be sure you and your work area stay dry; never weld when you or your clothing is wet. Be sure your welding equipment is turned off when not in use. Note that Lincoln wire feed / welders have a relatively low open circuit voltage and include an internal contactor that keeps the welding electrode electrically 'cold' until the gun trigger is pressed. These important safety features reduces your risk of electric shock during any welding project. It is essential that your eyes are protected from the welding arc. Infrared radiation has been known to cause retinal burning. Even brief unprotected exposure can cause eye burn known as welder's flash. Normally, welder's flash is temporary, but it can cause extreme discomfort. Prolonged exposure can lead to permanent injury. Before you get started on any welding project, it is important that you make sure your work area is free of trash, sawdust, paint, aerosol cans and any other flammable materials. A minimum five-foot radius around the arc, free of flammable liquids or other materials, is recommended. Extra care should be taken in workshops that are primarily used for woodworking as sawdust can collect inside machines and in other hard to clean spaces. If a spark finds its way into one of these sawdust crannies, the results could be disastrous. If your shop area is too small to allow for a safe radius, please use an alternate area like a garage or driveway. Cylinders can explode if damaged. Always keep your shielding gas cylinder upright and secured. Never allow the welding electrode to touch the cylinder. A fire extinguisher should also be on hand during any welding. Also, make certain no children are in the area when you are welding. They may watch the arc and can experience retinal damage from its intense light. There is also a risk of a child getting burned by welding spatter. Finally, see the instruction manual for your welder for added safety information. You can also visit the following web pages for added information on safety. Lincoln Electric Pro-MIG 135TM or other similar MIG welders available at a retailer nears you. The Pro-MIG 135 is powered by 120 volt household current. Cleaning solvent - Can be flammable. Keep away from your work area while you weld. Rust resistant spray paint - Can be flammable. Keep away from your work area while you weld. 2-1/8" thick mild steel plates measuring 17-1/2" x 29-1/2"
Check your materials. Lay out the materials in your work area and check to make sure you have everything required to complete the project. Don't forget your safety equipment and fire extinguisher. If you haven't already, cut your angle iron using your speed square to mark miters. Check the reference chart on the inside of the door of the welder to ensure you are using the right settings for the thickness of steel you are about to weld (standard on most Lincoln Electric compact wire feed welders). Test your settings by welding on a piece of scrap before you start. Welding the two frames for the table top and shelf. Using the square on the outer edge, place one piece of 30-inch angle iron and one piece of 18-inch angle iron together, mitered side down, making sure they are perfectly square. Attach your work clamp to one of the pieces of metal. With your welding face shield in place, tack weld the corners on the inside edges. The rest of the weld will be completed later. Using another piece of 30-inch angle iron and another piece of 18-inch angle iron, repeat this step to create the opposite corner of your frame. It is important to weld the opposite corners first to ensure right angles and a perfect fit. Now bring the two sections of your rectangular frame together and tack weld the remaining corners. Welding the tabletop to the frame. Position your frame flat side up. Place one of the pieces of steel plating on top of the frame and center it. Attach the work clamp to a piece of scrap steel and lay it on top of the table (see photo). Tack weld around the plate. Do not make full welds at this point to minimize distortion caused by heat. Tack the corners and one or two tacks per side. When all tacks are complete, weld over each tack weld placing a weld with a finished length approximately 3/4-inch long. Finish welding the corners from underneath. Both shelves should be assembled the same way. Squaring the shelves and attaching the first leg. Stand up one of the shelves on the long edge. Using the square to make sure it is at a 90-degree angle to the ground, attach one of the legs to the shelf with a C-clamp to hold it upright, like a kickstand on a bicycle (See photos). Position the second shelf parallel to the first and attach another one of the legs in the same manner (see photo). The shelves on our welding table are 28-inches apart. You can adjust that distance to accommodate your specific needs. Place one of the legs on the bottom shelf corner and place the top of the leg in the inside corner of the table's top. Tack weld it in place. Next, weld both edges of the leg to the to and shelf. Each of these welds will be approximately 1-inch long. Be sure to weld each side. Attach the remaining legs. Repeat the instructions on attaching the leg in step 5. 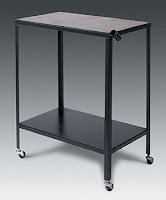 Check to make sure you completed all welds on both sides of each leg before standing the table on its own weight. Attaching the caster coupler nuts and casters. Place a coupler nut in the inside corner of the angle iron, flush to the bottom of the leg. Make a 3/4-inch weld on each side of the nut. Repeat this step on each leg. Let cool. Place a standard nut onto each caster stem as far as it will go. Place one lock washer on each caster stem and thread the stem into the coupler nut attached to the table leg. Adjust the height of the casters to level the table. Then, tighten the nuts to lock the casters vertically in place. Attach the welding gun holder. With a clamp, attach the 3-inch length of steel tubing to the right front corner of the top shelf of the table (if right-handed; be sure to switch to the left side if you are left-handed). Attach it at approximately a 45-degree angle with the front facing up to accommodate holding the gun (see photo). Tack weld the tube and remove the clamp. Make a 1-inch finish weld on the top side of the tube. Stand back, admire your handiwork and start on your next welding project. 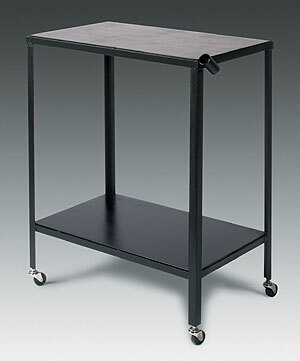 You may want to paint the welding table with a rust-resistant paint, but DO NOT PAINT THE TOP OF THE TABLE. You will want this to remain bare steel so metal parts placed on the table top for welding are in contact with the work. Before painting, clean the entire table with a cleaning solvent to remove machining oils. Mask off the top with masking tape and newspaper. Paint. If you found this project useful, please bookmark this Web site. In coming months, Lincoln Electric will be adding new welding projects that can be used to enhance your workshop and home.